The Japan Society has an excellent essay on the evolution of Japan's tea ceremony. As pointed out in The Book of Tea, the Zen monks who brought tea to Japan from China brought the powdered form, as this was the most common way in which tea was prepared. However, this practice was lost in China after the Sung dynasty there was overthrown by the conquering Mongols in 1281. In short, the matcha used in the tea ceremony, which you can still enjoy today, represents a snapshot of tea's distant past: Time travel in a cup. 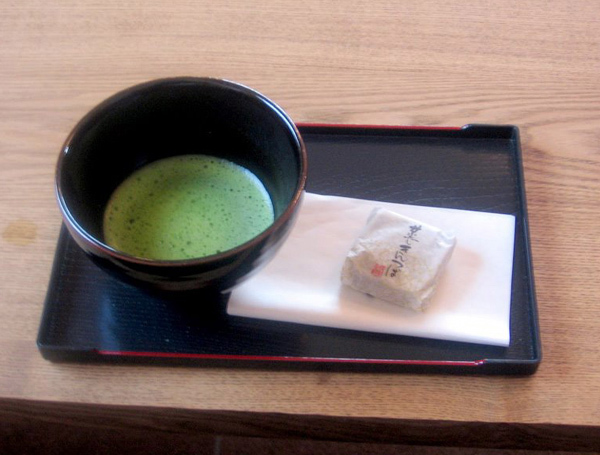 Frothed matcha with a piece of wagashi is a typical welcome treat at Zen temples even today.